02 January 2019, 16:04 p.m.
Not all Android manufacturers are equal in supporting their devices with OS updates, leaving many users on ageing flavours. AOSMark is a site which tells users the best manufacturers for updates while shaming those who are worst. Naturally, manufacturers with heavily ‘skinned’ Android operating systems are generally slowest to update as they customise the OS before sending it for lengthy approval via Google and each mobile operator around the world (for carrier-locked devices). To no surprise, Google is the fastest manufacturer to release Android updates to its devices. 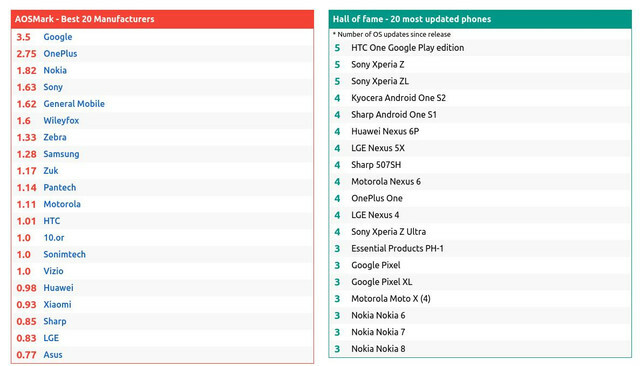 Manufacturers with little customisation – such as OnePlus and Nokia – take second and third place, respectively. Rounding out the bottom four places for Android updates is Xiaomi, Sharp, LG, and Asus. The rankings must not be taken for certain as AOSMark does not disclose its proprietary method of calculating the results. One aspect, for example, that would skew the results is whether the formula takes into account the number of various devices a manufacturer has out.